Veterinary eye exams may save your pets eyesight, or save their eye. Eyes that are suddenly red, blue, painful, or bulging are a veterinary emergency. These signs may indicate glaucoma (high eye pressure), injury, or other eye disease. Your dog or cat could lose its eyesight, or even its eye, without immediate diagnosis and treatment. The sooner we treat appropriately, the less likely there will be permanent damage. Our veterinarians can perform thorough eye exams. They check the nerves around the eyes, check for adequate tear production, examine for scratches to the eye surface with special dyes, and examine the back of the eye (fundoscopy). They can test your pet’s eyes for abnormal eye pressure using a device called a tonometer. This test is not painful and does not usually require sedation, but we do apply local anesthetic drops to the eyes. In the cases where a foreign object or chemical may have entered the eye, we generally recommend sedation and a thorough eye flush. The sedation allows our veterinarians to look under the eyelids and flush the tear ducts carefully, without harming or upsetting your pet. Breeds at risk for glaucoma include Akita, Australian Cattle Dog, Beagle, Boxers, Basset Hound, Bichon Frise, Boston Terrier, Chihuahua, Shar Pei, Chow Chow, Cocker Spaniel, Dachshund, Springer Spaniel, Golden Retriever, Great Dane, Maltese, Pekingese, Poodle, and Siberian Husky. Most dogs get glaucoma all of a sudden. This is different than in humans, where it often progresses slowly. 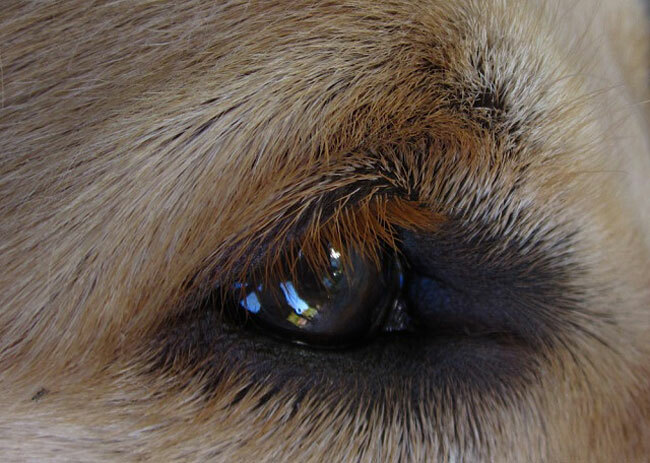 This means that, in most dogs, routine screening for glaucoma without any symptoms is not very helpful. Call us right away for an eye exam if you notice any of the following problems in either or both of your pet’s eyes: dilated (enlarged) pupils, clouding of the eye, red or bloodshot eyes, one eye protruding or appearing larger than the other, squinting, or tearing. Because many eye conditions are painful, your pet may react by rubbing or pawing at the eyes or rubbing his or her head against the floor or furniture more than normal. Depending on the problem, we may refer you see a board-certified veterinary ophthalmologist at the Veterinary Medical Center (VMC) at the Western College of Veterinary Medicine. Martensville Veterinary Hospital serves Warman, Waldheim, Osler, Hague, Rosthern, Langham, Dalmeny, Blaine Lake, the Saskatoon area and beyond. If you can not get in to see your regular veterinarian, or the VMC but feel your pet’s eye or eyes need urgent care, we can do the initial assessment and stabilization. Our files and results can be sent back to your preferred clinic. We promise our feelings won’t be hurt – we know how important that bond with your veterinarian can be, and know your veterinarian would see you if they could. Just let us know – most of your pet’s records can be sent in seconds via email, including digital x-rays and bloodwork results.